It's easy to look at 1949's World Series outcome, Yankees beat Dodgers in 6, and think it was "just another classic season." That results-only view, however, masks one of baseball's closest regular-season finishes, as both league pennants came down to their final day, Sunday, Oct 2. R.I.P. 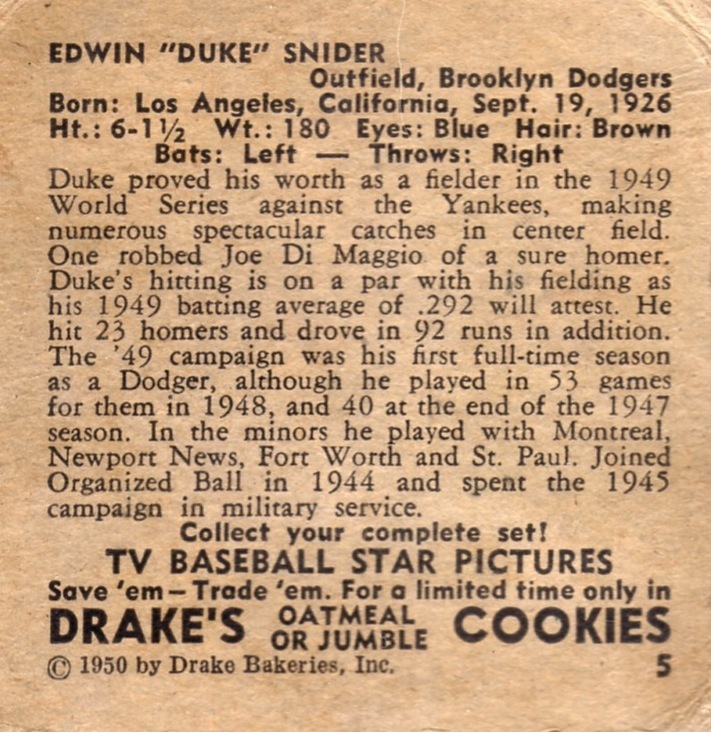 to HOFer Duke Snider, who enjoyed a break-out season in 1949 and made his first of 7-straight All-Star games in 1950. (Career stats at Baseball Reference.) Not sure exactly where they took this picture, but assume it's from New York, as the original home of Newman Drake and home base for his chain of bakeries. 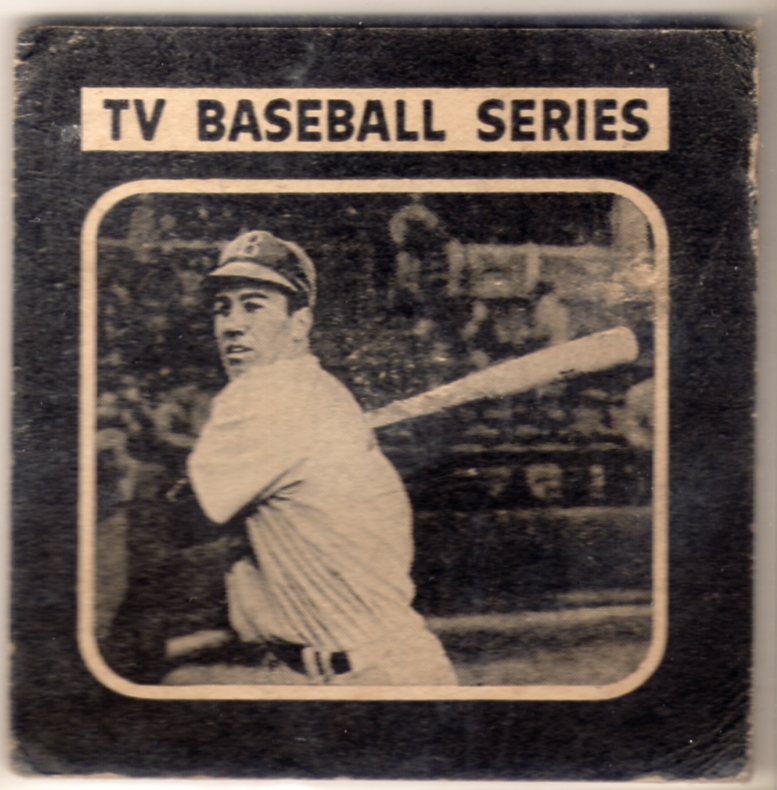 Drake's, best known now as makers of Ring Dings and Devil Dogs, assembled this set's 36-player checklist from only 3 cities: Boston (Braves/Red Sox), St. Louis (Browns/Cardinals), and New York (Dodgers/Yankees) and likely limited distribution to those metro areas. Picking those six teams was no accident, as eight of baseball's previous nine World Series featured at least one of them--and often both. 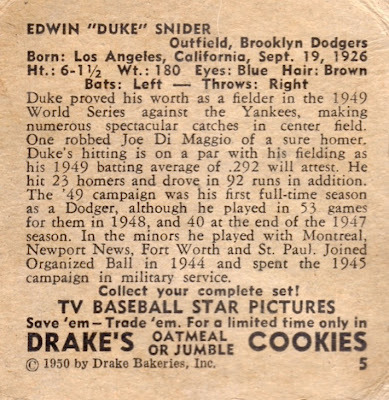 Value: Snider cost $125 on eBay some years ago. The set's HOFers run into the triple digits--even in low grade--and commons can cost $50+. Fakes / reprints: This obscure set's best pursued by advance collectors, due to cost and rarity. I recommend buying cards of this vintage from well-known dealers. Thanks for the Bilko and Cubs, Matthew, very much appreciated. Have not been checking the blogs for a while myself, so I missed some good stuff! Nice card. I love these...don't think I have Duke, but have Furillo, Campy and maybe 1-2 others. I'll have to go look.